Different material Ceramic ball bearing-Ningbo Haishu Nide International Co., Ltd.
Full ceramic bearing made with Si3N4 have some better performance than ZrO2, the rings and balls made by full ceramic material: Si3N4, as a standard constructor, the cage made by PTFE, generally we also could make the cage with GFRPA66-25, PEEK, PI, Phenolic Textolite Tube ,etc. Compares than the material of ZrO2, The SiN4 ceramics bearings could endure heavier load and could be used in higher temperature environment. 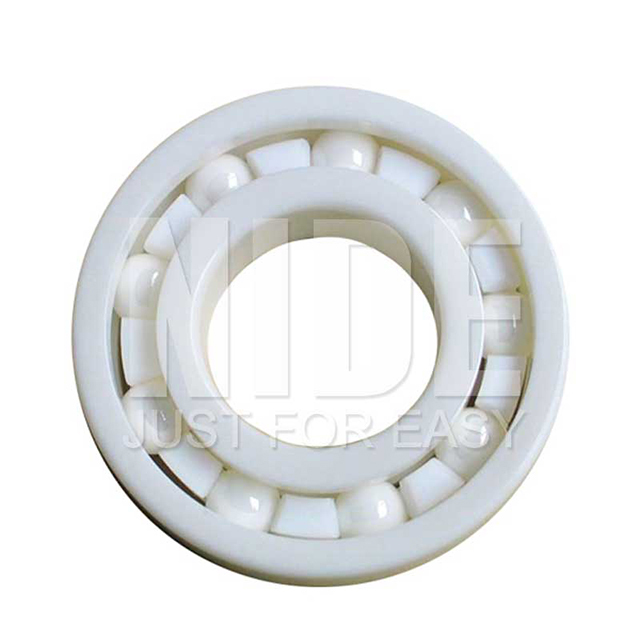 Also we could offer precision ceramic bearing which generally used in high-speed and high-rigidity spindle. the manufactured clearance could be P4 TO UP grade. Full ceramic bearing of full complement balls has an add-ball gap on its side. Because using no frame design, the bearing able to install more ceramic balls than the standard construction, so the heavier load ability increased more. In addition, to avoid the limited of the frame material, this bearing same as the full ceramic bearing of ceramic cage has corrosion resistance and high temperature application. This series of bearing is not for high –speed choice, it should be to install on the unforced side. Ceramic cage has excellence performance as wear and corrosion resistance, high strength, lubrication and maintenance free when working. Adopting the ceramic cage, Ceramic bearing can be used in the most inclemency environments as corrosive, low temperature, high vacuum. The normal used ceramic materials are ZrO2, Si3N4 or Sic.